So another adventure in Moldovan logistics leaves me wilted and limp from the effects of too much sun and an adrenaline rush. Some times I wonder if I will survive my Peace Corps service intact. This is my driver, Therry. 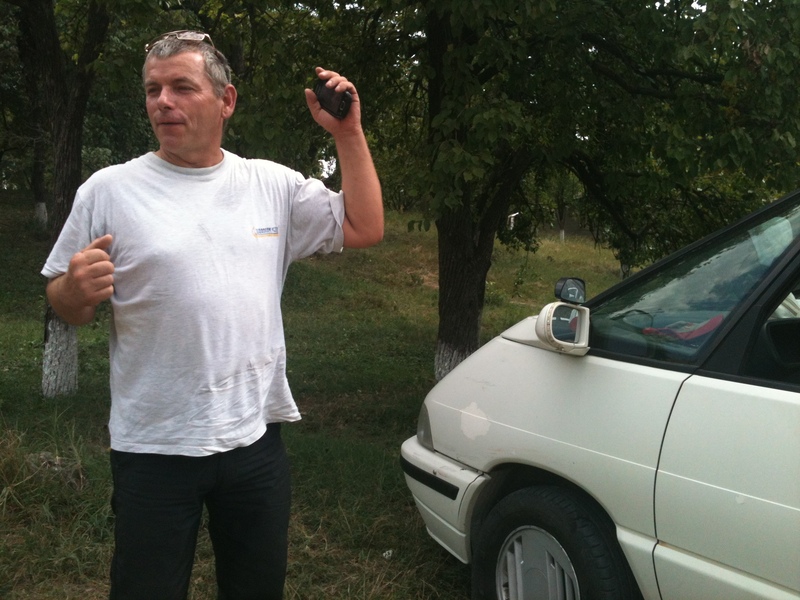 Now he’s not my personal driver, but he has been the person – other than anonymous rutiera drivers – primarily responsible for transporting me from point A to point B in Moldova. He picked me up in Chișinău and brought me to Hîncești, he drove Ana and I to a work-related meeting in Chișinău last week, and yesterday she arranged for him to drive me and two other PCVs to Orhei Veche for the Gustar music Festival (more on that in a minute.) He is somehow connected to Ana and/or the organization where I work, but the details remain ambiguous and elusive. Therry is French. He speaks only French, yet he’s lived in Moldova for more than two years. He doesn’t appear to have a job, yet he certainly isn’t without money or other resources. I asked him once (through Google translate) how he made money to live here and he actually made the sign for zipping his lips and walked away. That was the end of that conversation. Therry is almost stereotypically, cartoonishly French, his gestures are so animated and exaggerated. He is forever kissing women’s hands, arms and cheeks – a mode of greeting viewed as informally, inappropriately intimate and not usually welcomed or tolerated by Moldovan woman from perfect strangers. But somehow he gets away with it. Probably because he’s French. Therry drives in a manner commensurate with his personality – large, haphazard, and flamboyant. Lanes are not even suggestions, they’re meaningless markings left behind from some another rule-bound activity that couldn’t possible apply to him. One side of the road is as legitimate as the other in the race to reach his destination. Other drivers are obstacles placed in his trajectory that he must surmount and occlude. Potholes are launching pads for gaining air speed. At one point I checked the speedometer and he appeared to be doing 95. This, in a Renault four-speed van that was not manufactured in this century, equipped with just the shoulder-harness part of the seatbelts and door handles that only work from the outside. Now I understand why vehicle accidents represent the largest percentage of all Peace Corps’ in-service fatalities. And I’m not even in Africa. Therry was supposed to pick me up at my house at 10:00am for the two-hour trip to Orhei Veche. By 10:30 when he hadn’t arrived, I texted Ana. (This, and all my subsequent communication with Therry throughout our tumultuous day, had to be conducted through a web of communication devices involving my partner Ana, who speaks French and Romanian; her friend Doina, who speaks Romanian and English; Irina, who was in the car with us, but only speaks Romanian; and me. It felt a bit like the United Nations.) Ana texted back to say that Therry was at the vets with his dogs and would be here at 11:00. The festival was the just the juxtaposition of centuries I’ve come to expect from Moldova: horse drawn carts and hay wagons coupled with a state of the art sound system and cold beer on tap. A host of PCVs were there with tents and sleeping bags; they planned on making a weekend of it. Me? I guess 50 is NOT the new 18 when it comes to sleeping on the ground, peeing in the bushes, and negotiating crowds of party animals. I braved the ride back with Therry, whom we only found again after an hour of cross-texting and phoning between our multi-lingual navigation team. When we finally reunited (after another mile and half trudge in mind-bending heat – no wonder I’m losing weight by the hour) I climbed in the back, buckled my scrap of a seat belt, and closed my eyes. I didn’t open them again until Therry slammed us into the curb in front of my apartment. Man was I glad to be home. Maybe the more uncertain our lives get, and we face it boldly in an oscillating pattern with appreciation for our safety, the more alive we get? I enjoyed that music clip Yvette, thank you for sharing. And Therry would make a fine subject for a documentary film. Still looking forward to reading this roller coaster adventure in book form shortly after you return! I LOOVVVE your posts…look forward to them! The music clip is a real treat! Hang in there, Yvette! I wonder if the PC has a humor requirement?! You certainly passed that one! And the beat goes on….great share girlfriend!